Paper tubes and cores range from all sorts of sizes. 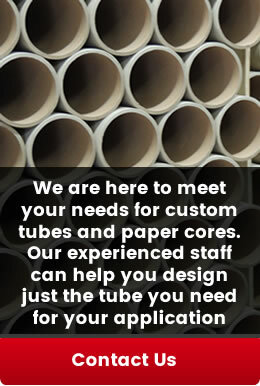 Custom Tube has made a name for itself and has a good relationship with all of our paper suppliers. We purchase our paper directly from the mills and DO NOT use any brokerage or "ODD" lot paper in our manufacturing process. Paper cores and tubes are often a cost efficient alternative to other more expensive materials such as plastic, metal, and wood. Our attention to quality is in the process of our manufacturing. We offer crush test and quality assurance with every tube we manufacture for all applications. So what's the difference from a paper tube and a paper core? The answer is simple. A paper tube means that the material or product goes inside the paper tube to protect it. A paper core happens to be the opposite, meaning your product wraps around the outside. Custom Tube understands the importance of protecting the environment in which we live. Custom Tube uses 100% recycled paper and our scrap is always returned to our suppliers for recycling.